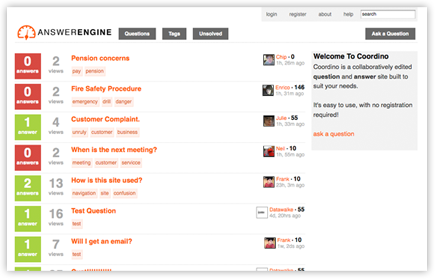 Coordino allows you to create a question and answer system for you and your users to enjoy. Whether you are looking to create a niche question and answer site for comic book collecting or looking for a knowledge base solution for your intranet, Coordino is here for you. Using Coordino you can utilize the community in your industry by combining their knowledge on your website. Over time your knowledge base can serve as a focal point for your niche or company. Keep your knowledge base secured on your system in your location. You have full control of the security of your users and your data. Coordino is updated on a regular basis adding features and implementing the requests of our customers on-demand. If you want to have a feature implemented contact us to begin the process. Why have yourself or anyone else reinvent the wheel? By utilizing a question and answer based system you can reduce roadblocks by having the answers right at hand.